This exercise is a massage for your brain. I first started painting these free form abstracts after I had Josie. Months of care taking, breast feeding, sleep deprivation, and everything else that comes along with a wonderful new baby, left my brain in a cloud. I was completely exhausted and desperate for a little "me" time. Like, I think I might be going a bit crazy here, desperate. Paint for play instead of purpose. Paint for you and your pleasure and no one else. Don't be afraid to make an ugly painting. This first lesson will help open up your mind to creativity and should be very meditative and calming and F.U.N. It's important to have an organized palette because your number one enemy to creating beautiful paintings will be colors mixing to brown. 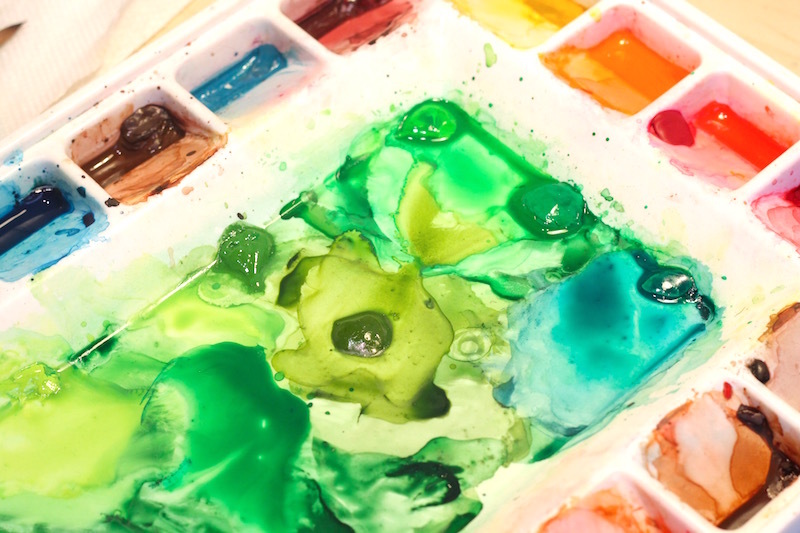 Organizing your palette from cool colors to warm in separate wells keeps the colors pure and makes for a much brighter and happier painting in the end. 2. Select your biggest brush and add the first color. It's usually wise when working in watercolor to start a painting with the largest brush and lightest colors. Think: big to small, light to dark. Make marks on your paper with this first color that are free flowing. 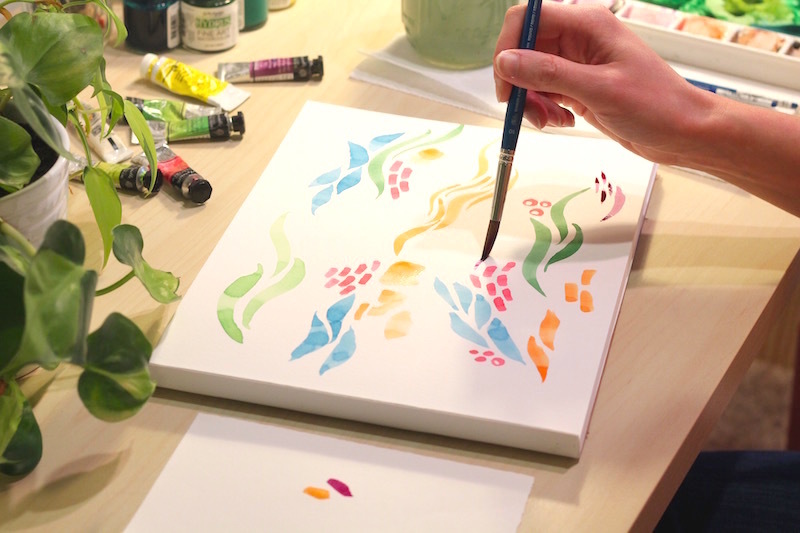 Experiment with holding the brush lightly against the paper and then pressing it down gently while making strokes. See how the line varies in thickness? See how when you press the brush down a bit and release, a little more water flows out of the bristles and leaves a cool texture? Try to keep the lines from touching at this point. 3. Change colors and add texture. Rinse your brush out completely in the warm water and load it with a different cool color (blues, greens, purples). 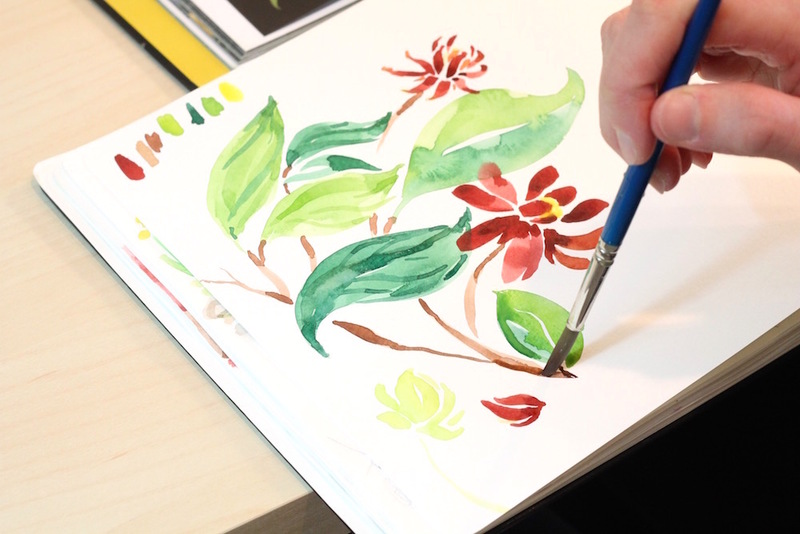 Turn your brush slightly at an angle in relation to the paper and use the side of the brush to make broad strokes. 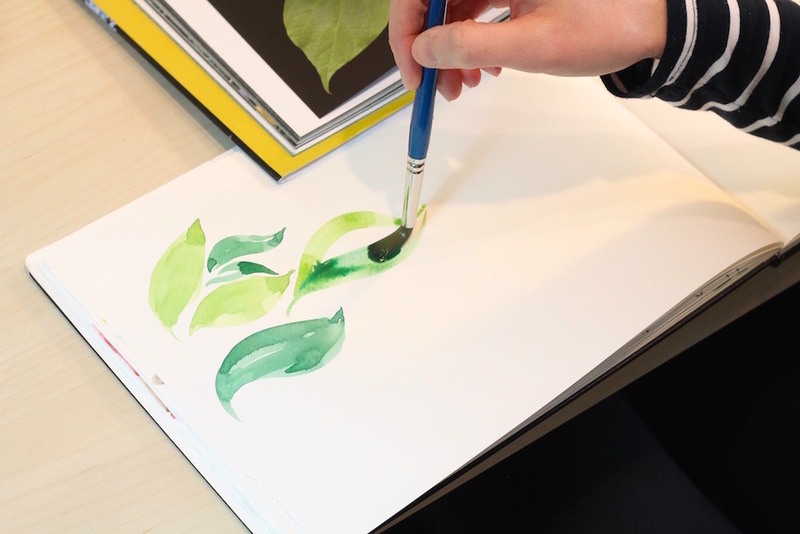 Then try making a different, smaller, leaf shape by tapping the brush gently on the paper in one motion. The water will collect and dry unevenly, which is one of my favorite reasons for using this medium! Just let the water do it's thing. 4. 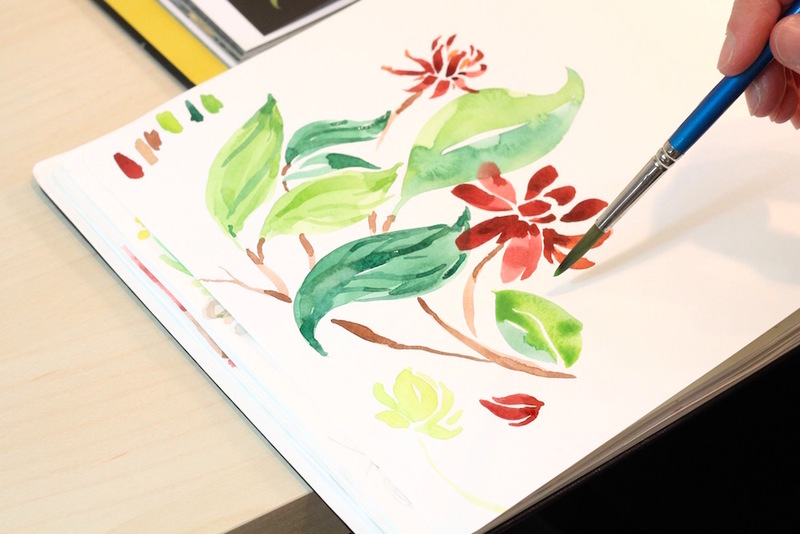 Use a scrap piece of paper to test colors. 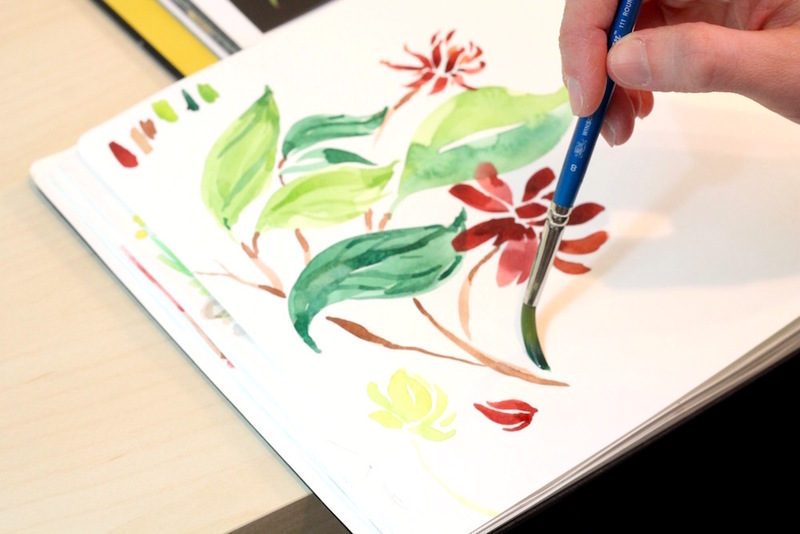 Before adding the next color to your painting, test it on a scrap sheet of watercolor paper. 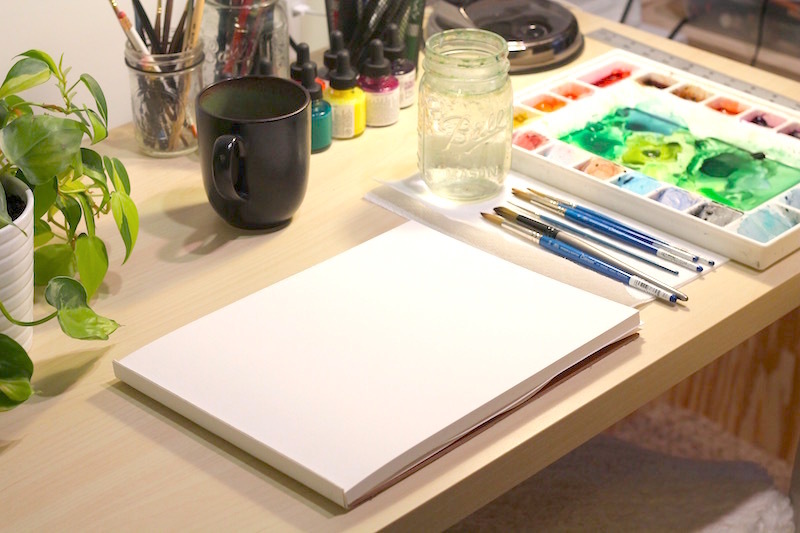 Keep in mind that colors will look very different from your palette to your paper. Testing helps you know whether or not the color on your brush is the one you actually want. 5. Repeat the process with each brush and color. Always rinse your brushes out completely between colors and NEVER leave the brush sitting in water. Brushes should always be stored laying flat while drying. Use your size 8 brush next and experiment with a new color. Try to make at least 5 different kinds of lines and shapes with each brush. Try circles and dots and pressing the bristles down at different pressures. Use the very tip of the brush and the side. Do the same with the rest of your brushes. Make as many different marks as you can with each of them. Try to use every color on your palette! If you run out of room, start a second painting. 6. Let the painting dry and add a second layer. Watercolor dries very quickly. Some of your marks are probably already dry. Let's use a #4 brush and add texture on top of some of the marks you've already made. This technique is known as working wet on dry. I'll show you how to get amazing texture by working wet on wet in future tutorials, but for now, let's stick with the easier technique that allows you more control. Add lines and dots and organic shapes to this second layer. You can be done with this painting whenever you want to be done. I usually stop when I feel a sense of satisfaction or when the page is full. Do you feel like you have a better sense of how to use your brushes? Do you feel slightly more confident in your color palette? Feel free to paint as many of these "free form abstracts" as you want! A great way to come up with new shapes and colors to paint is to study reference materials. 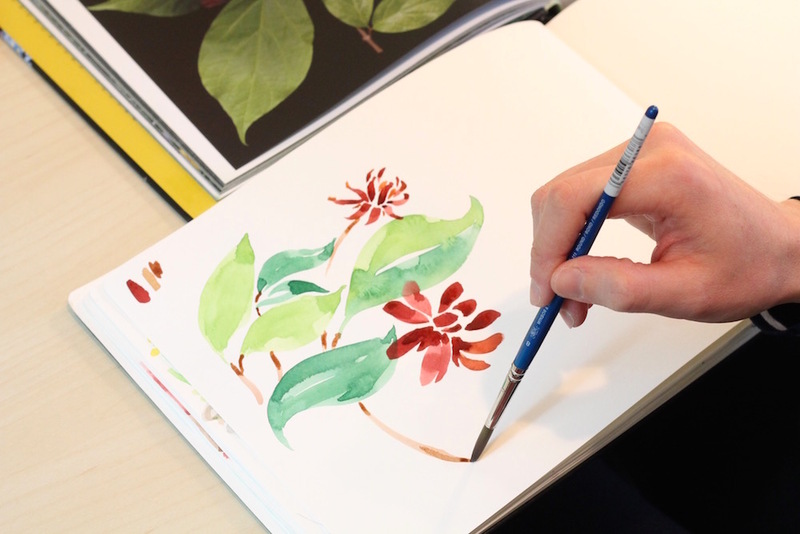 Pay attention to your surroundings, go for a walk, study a leaf or a flower, check out botanical books from your library and try to notice all the shapes and colors around you. Try to emulate that in your painting.